PN 507 - 8 hole height adjustment channel for 1-1/4" receiver tubes. 503 - Bolts directly inside of standard, 3 inch wide, height adjustement channel. 2 7/8" wide. 511 - Slides into a standard, 2" receiver tube. Can be set 2 1/2" higher or lower than receiver tube. 517 - Slides into standard 2" receiver tube. Can be set 4" higher or lower than receiver tube. 502 - Bolts directly inside of standard, 3 inch wide, height adjustement channel. 2 7/8" wide. Limiter Model -102- Coupler with rotation limiter that can be welded to your custom application. 528 - Bolts or welds onto any 2" wide trailer tongue. 514 - Welds directly to trailer tongue or custom brackets. 3"sq x 5/8" plate. Limiter Model -112- Coupler with rotation limiter that slides into standard 2" receiver tube. 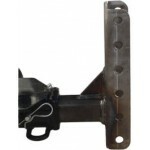 504 - V-shaped, industry standard, 50 degree bracket. 506 - Bolts or welds onto any 2-1/2" wide trailer tongue. 11-3/4" tall adjustable height channel bracket. Bracket material is High Strength/Low Alloy .. Copyright © 2019 Great Lakes Forge Co., Inc.